Have you Seen These Billboards? A funny thing happened on the way to frag my Half-Life 2 competitors. There are many hundreds of Half-Life 2 servers to choose from on any given night. 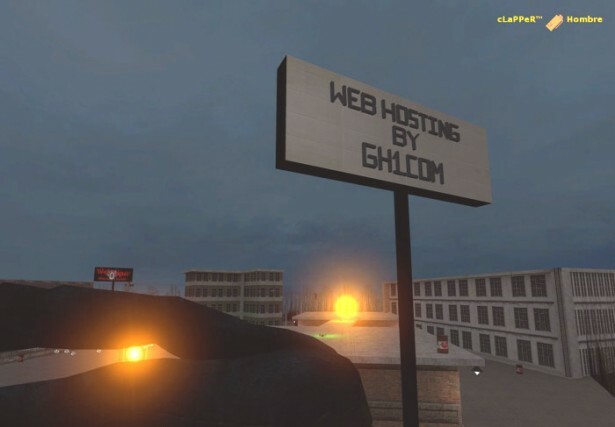 This night, I joined WebViper‘s Skul’Shock South server. 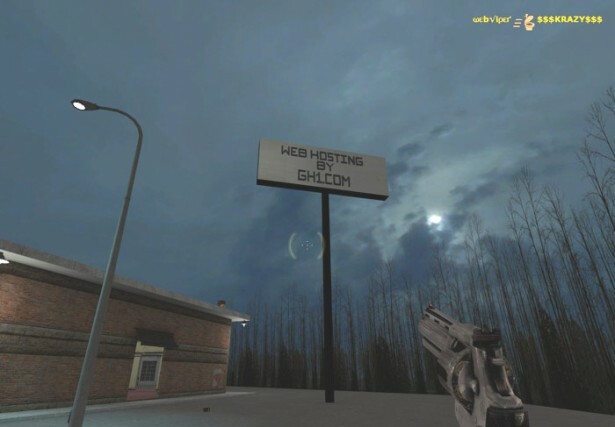 Like a lot of PC gamers, WebViper creates his own custom maps. 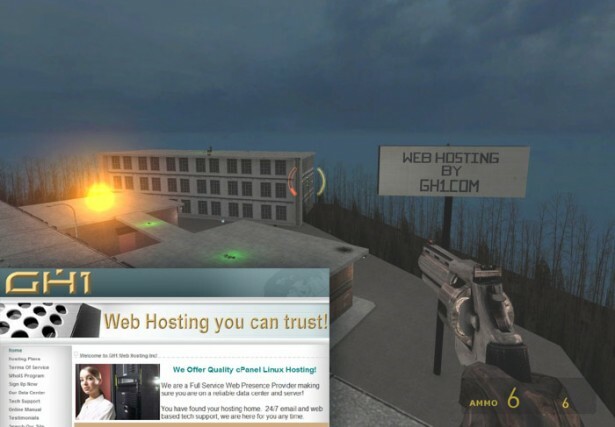 He even has his own mod of Half-Life 2 running on his server. A custom map maker creates his own environment, placing weapons, determining respawn points and inserting his own props to maximize gameplay. Custom map making can consume a great deal of time. I know because I made a few maps for Duke Nukem 3D a long, long time ago when I should have been doing things like, oh, say reserving domains such as business.com. But, that was a different stage of my life. In-game advertising just might be a sweet way that mappers and modders can get paid for all their hard work and creativity. Unlike other servers, we don’t beg for money. It’s 100% free! So, I join the game and begin fragging my opponents and what do I see on the billboard in front of me? Someone wants me to know that a company called GH1.com offers web hosting services. I took some of the screen shots below to share with you. In fact, I risked my virtual life to grab these images as several times I found myself respawning after curiously staring at these web hosting ads which would have been ignored had I seen them on an actual Web page. There is not much leisure time for sight seeing in Half-Life 2, if you know what I mean. 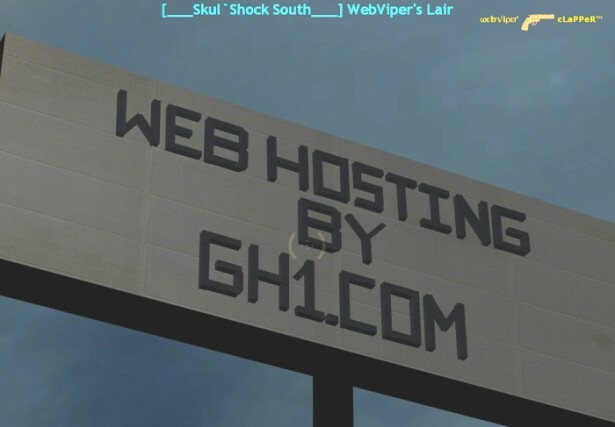 GH1 web hosting site — the website image in the bottom left corner does not appear in the actual game, I just superimposed it over the screen shot here so you can see what GH1.com looks like in a browser should you visit the site. Is this the prelude to pay-per-frag advertising? Is there really time for consumer research in Half-Life 2? Since the number of people participating in online gaming would seem to be on the rise it would seem that advertisers should be able to reach gamers with the right approach. But what should that be? Will it cut the price of pc gaming software? What would the payment models be? I have not read any research about the subject but I wonder if in-game advertising will work. Alligator escapes from Atlanta Zoo? 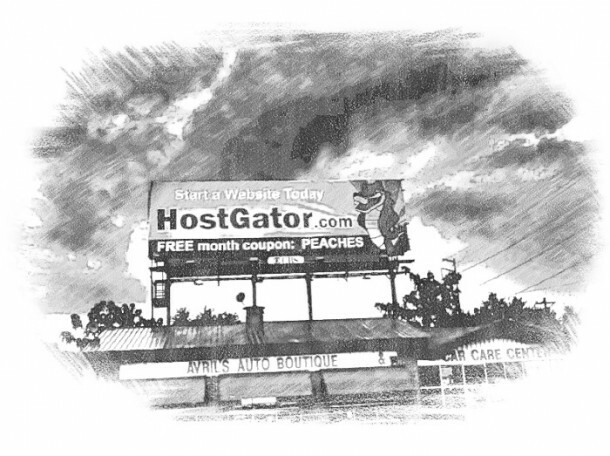 HostGator’s September 09 Newsletter says the company currently has billboards “posted in 10 major U.S. cities and that number will be increasing soon.” I’ve been noticing HostGator billboard ads in the Atlanta area since September. Okay, I’ve seen web hosting billboards fragvertised in games and I’m accustomed to seeing the blue and yellow HostGator mascot “Snappy” online, but on the way to work? On the way to dinner? While running errands? I’m going to have to adjust to that. HostGator is not a host I’d call modest when it comes to advertising, whether online or offline. Their bite into advertising can sometimes annoy loyal web affiliate advertisers who receive 400k in payouts per month (apparently this figure does not include Commission Junction). Consider this. If I’m on my way to get a cheeseburger after work, am I going to see the HostGator billboard, pull over, and order hosting for that new Web site I’ve been wanting to build? No, but here’s the scenario that affiliates may fear the most: I am going to either write it down or force myself to remember the name in the largest lettering: Hostgator.com. When home, I Google “HostGator” and click the number one listing (Google displays the brand site first in organic search). Unless I decide to do some research or comparisons, I’ve just bypassed affiliates and gone straight to the source to purchase my web hosting. Do billboard ads “take” sales from online publishers? 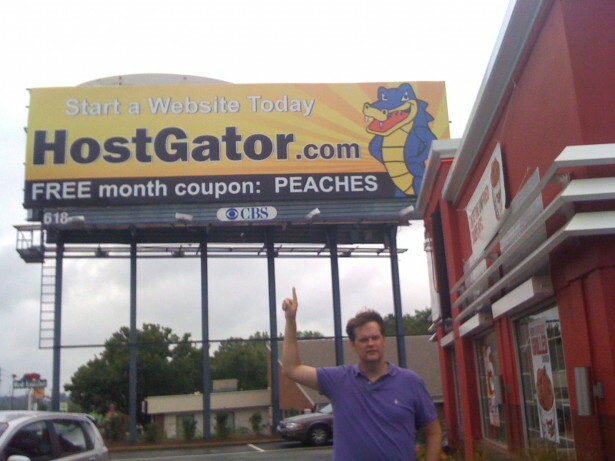 Will HostGator billboard advertising even work? How about we have some fun with HostGator’s latest campaign. Let’s do a crude test. Let’s take the three HostGator billboards in my neighborhood and see how long they stay up, the assumption being that no company would continue an unprofitable ad campaign. Estimated start: Sept 09. Status: removed. See you later alligator? Not yet. It’s still there right next to the KFC on Cobb Pkwy, Marietta. Dude, get some chicken and stop standing there like a nerd. Estimated start: Sept 09. Status: removed. This reptile at Roswell Rd and W Wieuca went into hibernation by November. I think a whiskey ad appears now. Estimated start: Sept 09. Status: removed. This one took me by surprise because of it’s remote location on Upper Roswell in Marietta. Gareth, that part is not actually in the game. It’s an image superimposed over the screen shot so you can see what the website looks like. I shouldn’t have done that because it’s confusing. The rest is all in-game. Looks really good Half Life 2. In the first photo is that an advertisement stuck in the game?? It’s definitely tacky, and I just wonder about the whole campaign – after all, when I decided I wanted a host for my blog, not only did I shop around and read reviews but I asked people actually running sites what they used and whether they had any problems or not. 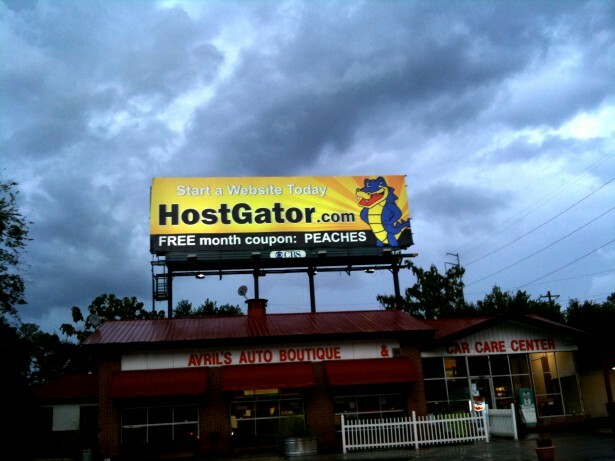 These billboard are useless for an online company such as HostGator. No, I wouldn’t be too worried as an affiliate marketer. 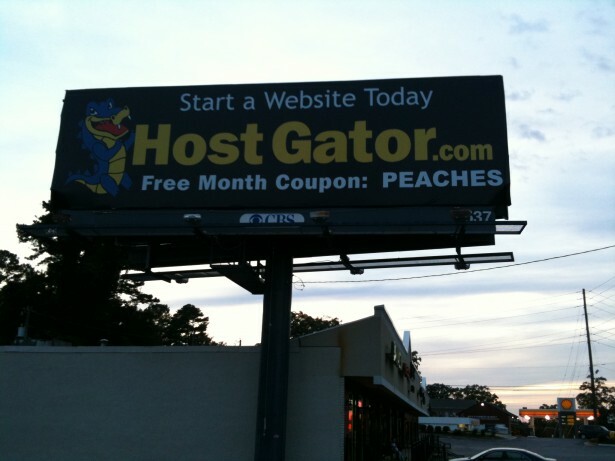 Yes, Hostgator will get more people to sign up, but the people who sign up based on a billboard weren’t my target audience more than likely anyway. I advertise online, so I’m targeting people who search online… not on roadsides! In other words, I don’t think lost sales will be meaningful. Have you seen your affiliate sales decline? Are all of the last remaining billboards still up? Darvin, I haven’t seen much change to date. 2 out of 3 of the billboards are still up. I’ll keep an eye on them and post back. I do think the billboard advertising would be useful for brand building. I live up in Canada and I have never seen web hosting advertised offline before. I definitely think it would grab peoples attention here. However, I don’t think a single person would use the promo code. Not sure if it’s the right thing to do or not but one thing I have noticed is all the empty billboards that I see around now days. Not sure if they are the best place to put your advertising money at this time. Sometimes ads like those work, but it depends on what kind of people will be attracted to it; Techie people and people who wants to start an online business for example.